Despite reports of their being few butterflies in general there are still some excellent records coming in. Jim Goltz and James Walde photographed a Common Buckeye at Southwest Head, Grand Manan, on September 2. 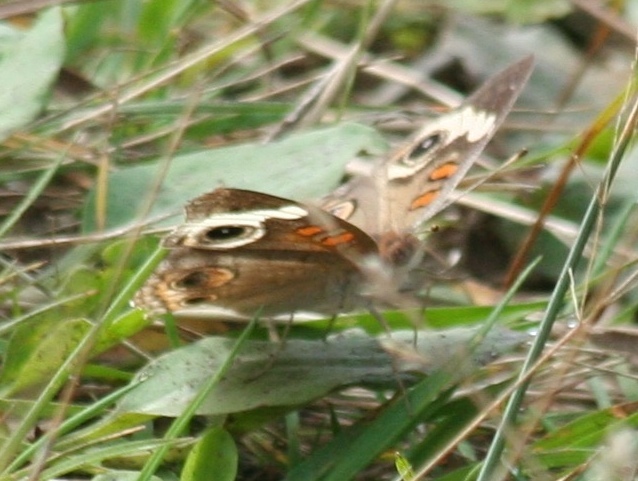 On September 4 David Christie also photographed Common Buckeye at the same location. Hopefully a comparison of photos can be used to determine if it was the same individual. This is the second, and maybe even third, record for this rare vagrant in New Brunswick this year! This species is most likely to be recorded in southern and western New Brunswick, but it could show up anywhere so keep your eyes peeled. There are records as late as September 19 in Maine. Common Buckeye, Southwest Head, Grand Manan, September 4, 2011. Photograph by David Christie. Ken McKenna and Rita Viau both documented Salt Marsh Copper in Richmond County, Cape Breton, in late August. Ken netted one at Point Michaud on August 27 (the identity of his specimen still needs to be confirmed), then Rita Viau photographed several at Gracieville August 30. These records are the first for the Atlantic side of Nova Scotia. 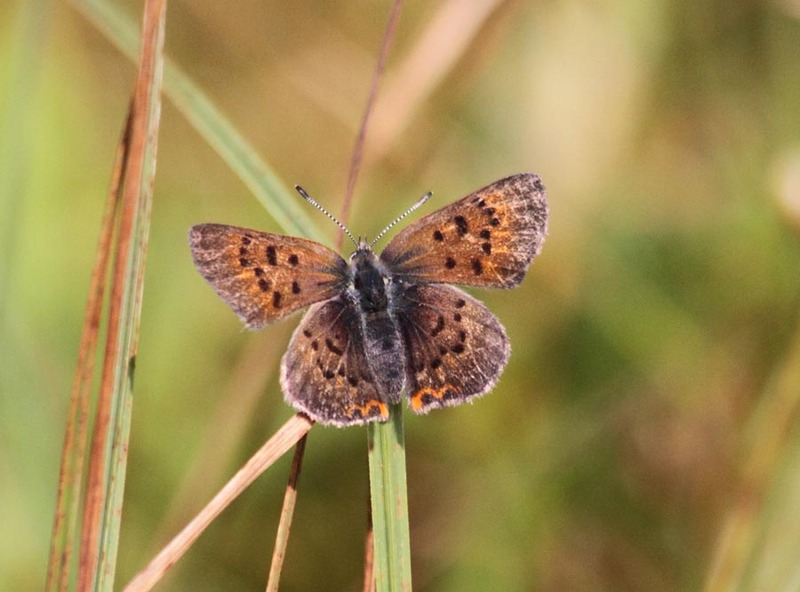 With each record that further extends the eastern extreme of this butterfly’s range it seems more and more likely that Salt Marsh Copper is going through a range expansion. It will be very interesting to see if it moves into Guysborough County or even further south along the Eastern Shore. It is getting late for the species, but if you’ve got a favourite salt marsh nearby it is still worth a look. Salt Marsh Copper, Gracieville, Cape Breton, August 30, 2011. Photograph by Rita Viau. 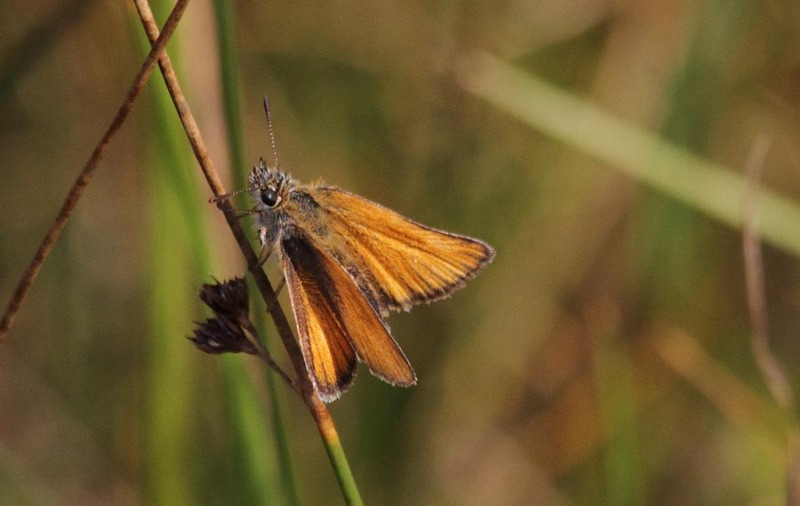 Rita Viau also had an unusual European Skipper record from River Bourgeois on September 1st. You might be thinking it is difficult to get excited about any record of this exotic species, but her record is exceptionally late. In Maine the species has been documented as late as August 19-24, in Massachusetts as late as August 15. The latest date I know of for the Maritimes is August 24. European Skipper, River Bourgeois, Cape Breton, September 1, 2011. Photograph by Rita Viau. The butterfly season is starting to wind down, but the records from the past couple weeks demonstrate there are still things on the wing. Keep your eyes out for Bronze Coppers in Ducks Unlimited style impoundments. It is most abundant in the Westmorland NB – Colchester NS area, but it has also been found at a few locations in Prince County, PEI, and in the 1970s and 1980s there was a population at Shubenacadie Grand Lake, NS. This gorgeous species flies until mid-September in wetlands where its host plant, Water Dock (Rumex orbiculatus), grows. As mentioned by Denis Doucet on the Nature NB Listserv, Eastern Tailed-Blues have been recorded in early September in Grand Manan, so they are likely still on the wing. This species is known only from southwestern New Brunswick. Peck’s Skipper has a weak second flight this time of year; Rita Viau recorded one at in River Bourgeois September 1st. Common Branded Skippers and Least Skippers are also still flying.